I’ve been a hiker and backpacker all my life. For more than 25 years now I’ve hiked throughout the White Mountains of New Hampshire, forests of Massachusetts, parts of Wyoming and Colorado, and other countries all over the world. For one Summer in 1991, I was a Student Conservation Association intern for the US Forest Service on the Medicine Bow National Forest. But after that Summer life intruded on my opportunities to give back to the hiking community by doing trail work. In 2012 I bought a new daypack and wanted to test it a bit before heading to New Hampshire. I went looking for a place near my home in Massachusetts that would have some hills and the chance to put in a few miles to see how the pack would feel. I stumbled across the Rock House Reservation and spent a few hours walking around. I loved the pack. But on the way back to the parking lot I found a sign saying that the Trustees, the organization that managed the property were looking for a volunteer property steward to help with caretaking and management. So I sent an email and to cut to the chase, I have been the main property steward at the Rock House and a few other properties ever since. Managing a property like this poses a unique challenge. The Rock House is only 196 acres in its main area with about 3.5 miles of trails. It presents a microcosm of a much larger area: mixed hardwood and coniferous forest with all the trees and branches that fall in storms, trails that climb and descend steep hills and suffer erosion, trails that cross small streams, and trails that traverse flat areas that are flooded or wet with impossible drainage for parts of the year. So as a trail maintenance exercise I have to do all the same stuff that people do in National Forests, just in a concentrated area and usually by myself. I’ve found plenty of information on maintaining trails for large agencies with crews of people. But no one posted much of anything about what works for one or two people in smaller compact areas where I find myself these days. I intend to rectify this problem in the next few posts. Clothes, packs, and common tools. Mechanical advantage and tree clearing tools. Miscellaneous stuff for special projects. There are plenty of articles and videos that cover this stuff in great detail. That’s not my intention – this won’t be a comprehensive lesson in how to do trail work. Rather, I intend to just highlight a few things that I’ve learned along the way or some gear that works particularly well for me. With any luck, you’ll find this stuff interesting too. It’s pure dumb luck that I decided to blow up my blog and start over right in the middle of sugaring season in Massachusetts. For the last six years, I’ve tapped trees in my yard to make small-batch maple syrup for my family and a few friends. Seasons have been up and down for the last few years. Weird Spring weather jumped from really cold to really warm in 2016 and 2017, so the sap run was short. But this year has been different with the perfect combination of warm days and cold nights lasting for weeks. I’ve almost tripled the amount of sap I collected last year, and a few of the trees are still running and the buds haven’t really opened yet. 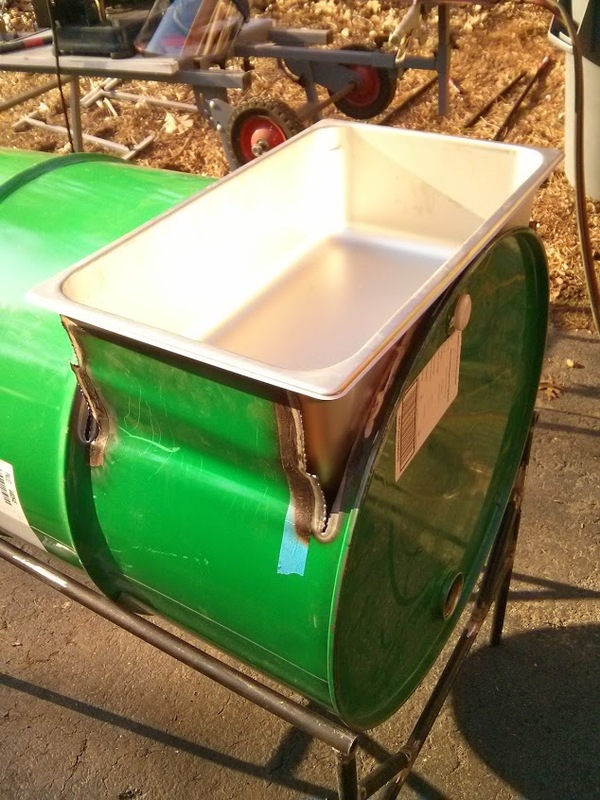 One of the most popular posts on my old blog, which I’ll try and resurrect someday, was instructions for how I made a maple syrup evaporator out of an old olive oil drum and some steamtable pans. It took only a few hours to make and for a first attempt, it worked well. With a few more improvements it continues to serve my backyard syrup operation well. This year it’s processed about 30 gallons of sap and produced a little over a quart and a half of maple syrup. For a backyard with only twelve taps and only medium-sized trees, that’s pretty good. With a little luck there’s another half-pint to be had and we’ll put away nearly 2 quarts for the coming year. And, since I use a wood-fired evaporator, I’ve been able to burn a lot of the branches that recent storms brought down. #winning! Resurrected post. This was originally published on my old blog on April 23, 2014. I've fixed some broken links and made some minor updates to fix grammar and flow problems. I needed another metalworking project for this Spring. For the past several years, I have tapped several maple trees in my yard and made maple syrup. After a few years of boiling the sap in pots on a turkey fryer burner, I decided I needed something a little bit bigger. And I decided that something wood-fired would be the most appropriate, and the most fun to build. 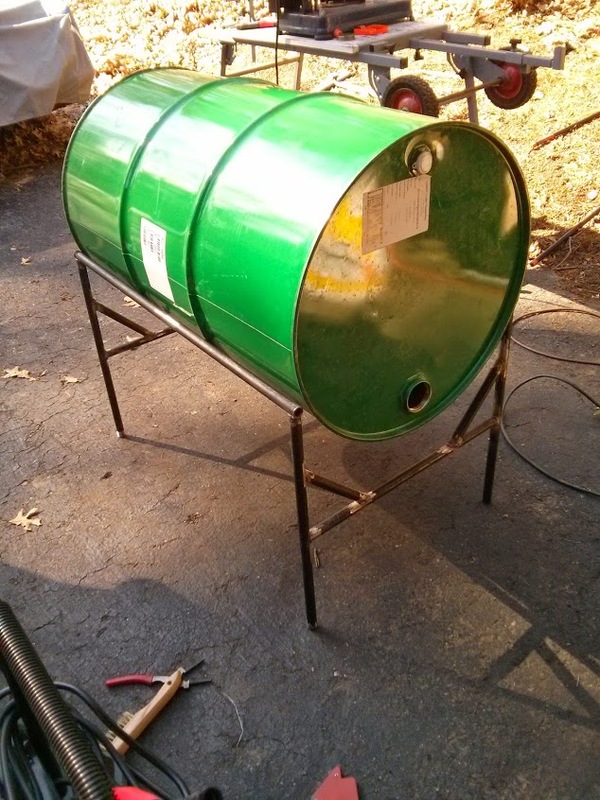 After looking online for ideas it seemed like the easiest plan would be to convert an old55-gallon drum to a wood-burning evaporator. With a used olive-oil drum bought on Craigslist, a couple of cheap steam table pans, a barrel stove kit, some black iron pipe for a frame, an oxy-acetylene cutting torch, grinder, and some tools, I slapped one together in a day. Finding used 55-gallon drums for sale is easy. Finding used 55-gallon drums for sale that didn’t contain toxic chemicals or flammable liquids is much harder. Luckily here in Massachusetts the Catania Oils Company imports and bottles olive and other oils under the Spagnoli, Marconi, and other brand names, so a used olive oil drum was cheap and easy to get. The black iron pipe frame and barrel can be separated to make movement and storage easier. Two pans allow the sap to be warmed in the upper pan before being moved to the lower pan. The chimney is completely removable. It has a main evaporator pan and a warming pan. Used steel drum. This one contained olive oil and I bought it for $10 on Craigslist. 1/2″ ID black iron pipe. I used about 20 feet of it. Cost about $50 at Lowe’s. A barrel stove kit for the door and chimney collar. ($40 – $60. Got mine on Amazon.com). 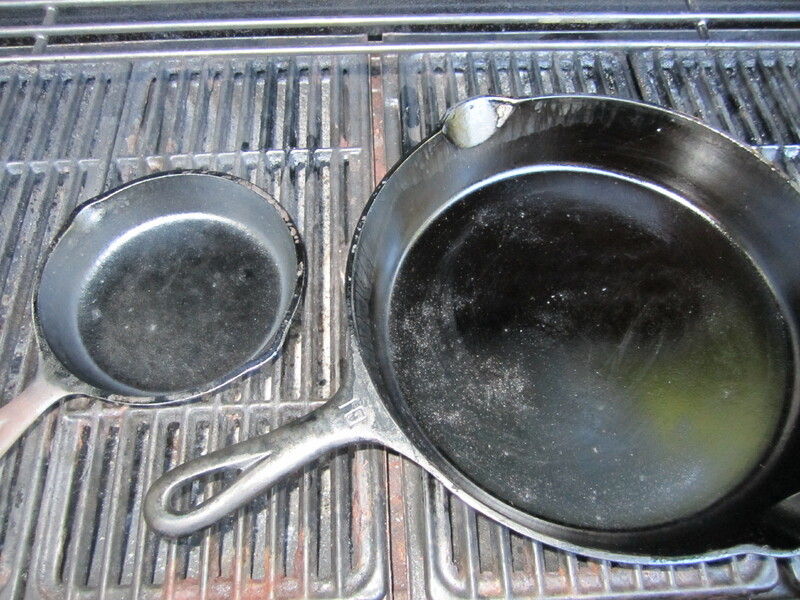 One full-size and one half-size steam-table pans. I bought mine new for about $30 with shipping from an online restaurant supply company. But you might find cheaper at a local auction or on EBay. Most of this project was accomplished with the basic metal-working tools I already owned. 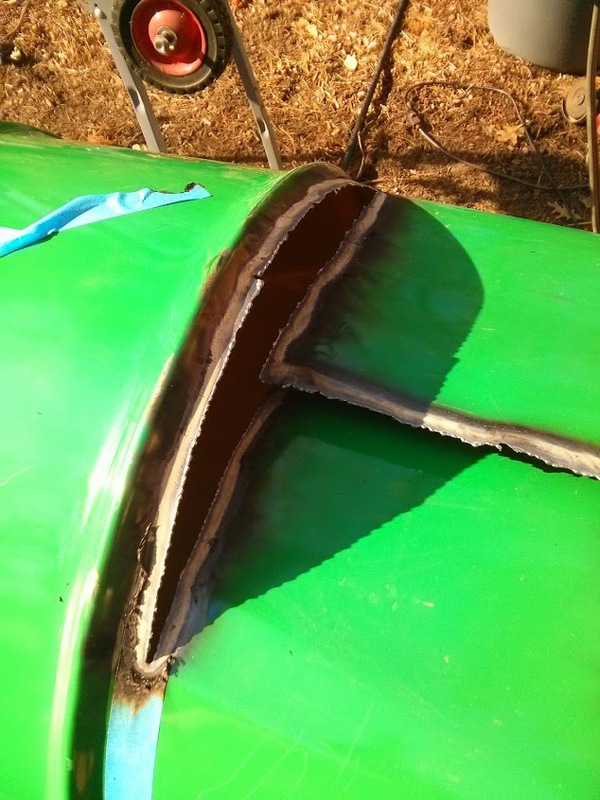 The pipe base was cut on a cheap chopsaw, fitted with an angle grinder, and MIG welded together. The barrel was cut with my oxy-acetylene torch (using a fine #000 tip). A lot of grinding was done with a 4 1/2″ Harbor Freight angle grinder. 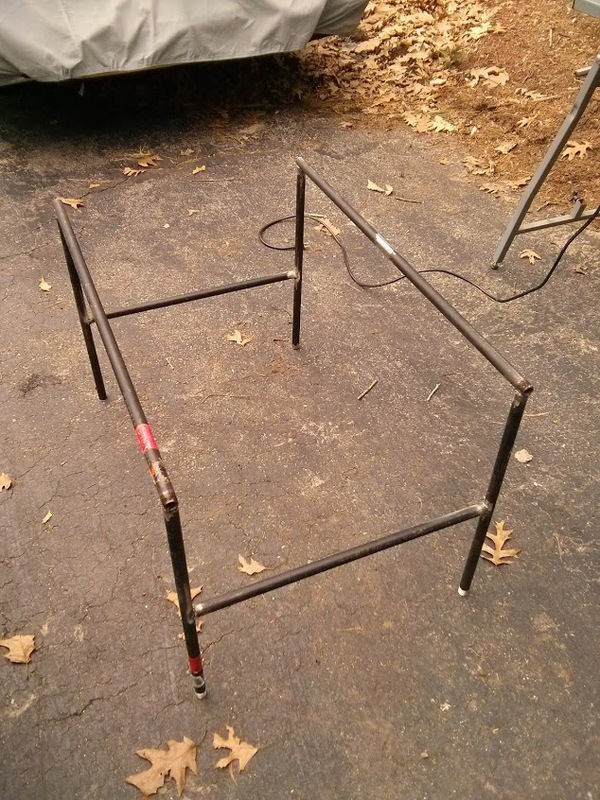 Build a frame from steel pipe. Cut holes for the steam table pans. Add a chimney and stove door. Evaporator frame. I eventually added 45° braces to the front and back to make it sturdier. I sized the frame so the barrel would rest on its two ribs, and the top and bottom lip would overhang just 1/2″. The barrel on the stand. Extra bracing has been added to stabilize the sides. My intention was to have a main evaporator pan and a warming pan. I mounted each of the pans between the barrel ribs to preserve strength. For the main pan, I wanted it sunk in as far as it would go to move it closer to the fire. I basically cut two “flaps” in the top of the barrel and bent them upward (like swinging doors). Then I trimmed them down until the steam table pan rested on the front barrel lip and the flaps on each side helped hold it up. Flaps cut for main evaporator pan. Flaps hold up the pan on both sides. Follow the directions that came with your kit. Overall the whole thing was fun to build and worked well enough. One thing that proved tougher than I expected was getting the fire close enough to the bottom of the pans t really get a good boil going. I ultimately ended up adding a couple of half concrete blocks to the barrel to elevate the fire. But the whole system did work faster than the old turkey fryer. If you are at all handy with metal I encourage you to try and make one of these. Ressurected post. This was originally published on my old blog on 8/3/11. I've fixed some broken links and made minor updates to bring it back. I was cleaning out my basement this weekend and ran across a box I had forgotten years ago. When my parents finally sold our old farm in Pennsylvania I managed to salvage some of the unique cookware that they had collected. 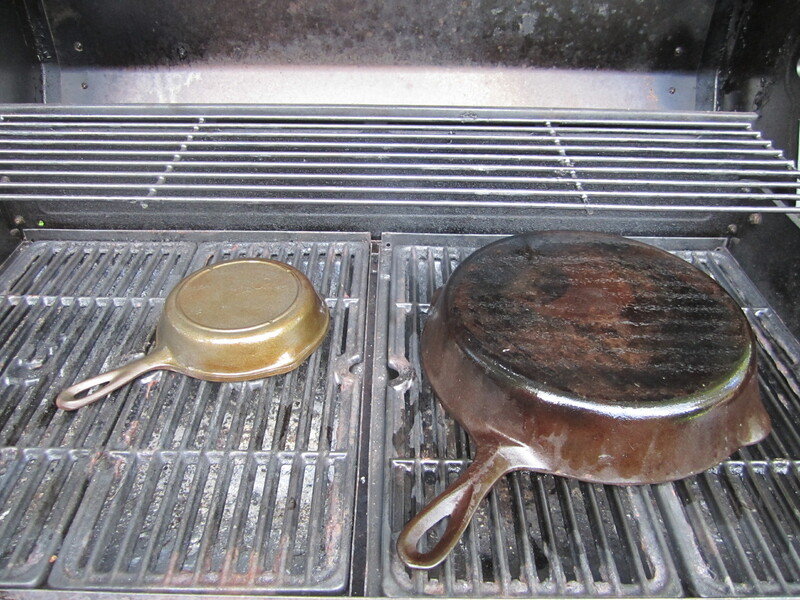 This apparently included a couple of cast iron pans including a #10 late-model Griswold skillet. 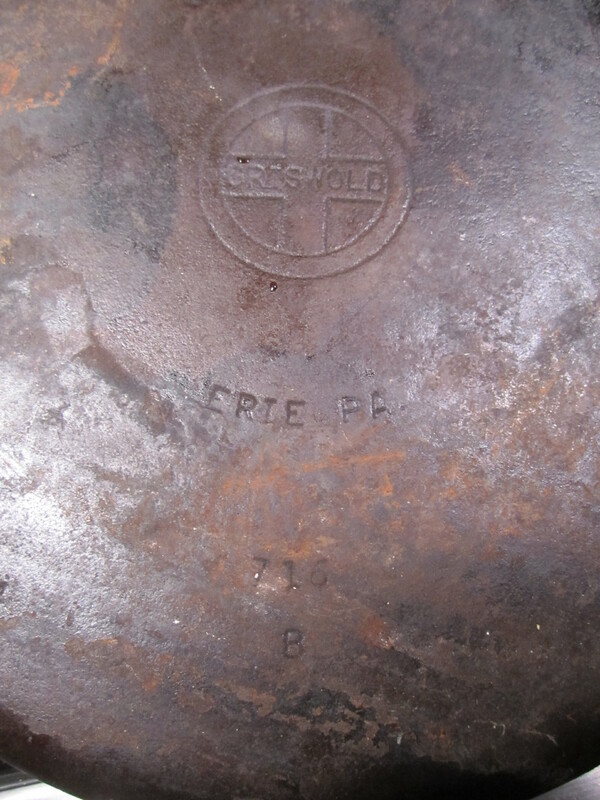 For those up on the latest cast iron news, Griswold was an American manufacturer of cast iron cookware from 1865 to 1957. 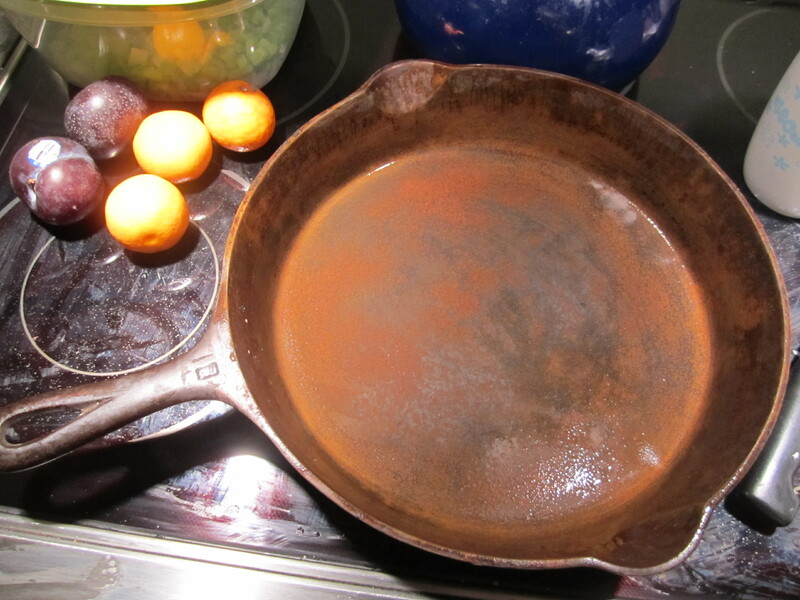 Some of their pans are quite collectible. 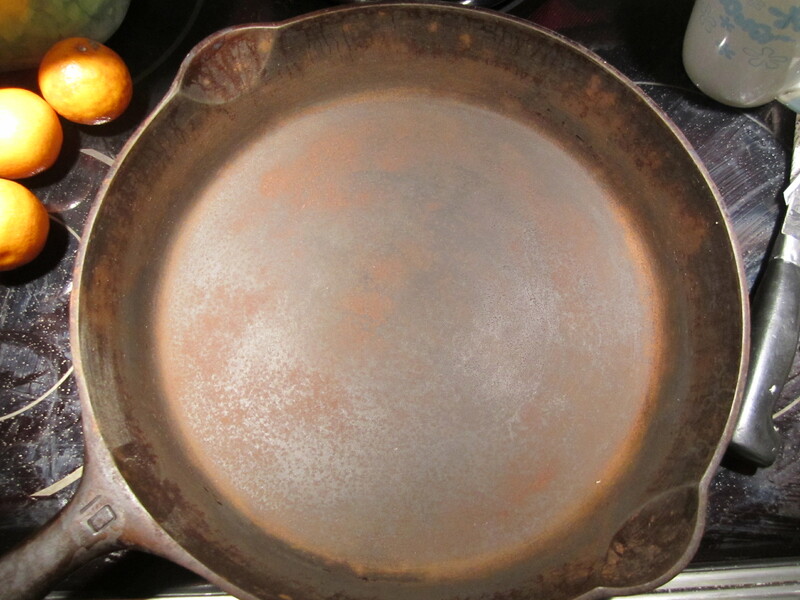 Mine isn’t, it has a small logo, but it’s still a decent cast iron skillet. The problem was that they were rusted pretty badly. So I needed to bring them back to life. 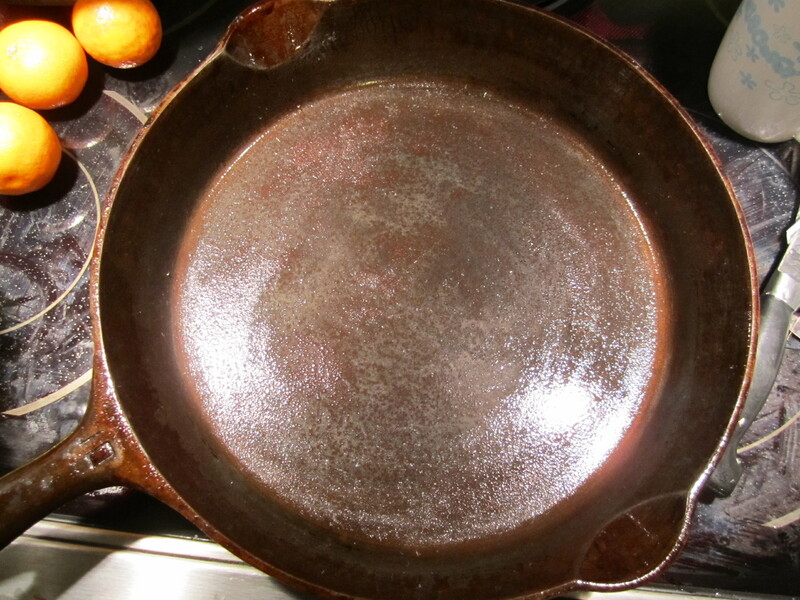 1 Start with a very rusty pan. Rinse with water and scrub with a Scotch-Brite. Steel wool will work if you have it. I was trying to avoid having to sandblast it. 3 A quick wipe-down with canola oil. 4 I heat my grill to about 500 degrees, then give the pans about 10 minutes to heat up. Then give them another good coating of canola oil and place them face down on the grill and close the lid. I use a grill rather than an oven because who really wants the smell of smoking hot oil in the house. 5 Let the pans bake for 30 minutes, then turn down the heat and let them cool. 6 Here are the pans with a nice smooth season on them. Resurrected Post - Originally published April 9, 2011, on my old blog. I've made very minor updates where needed to fix broken links and a few other changes. What’s the point of living in New England if you can’t make your own maple syrup? Among products from the garden, maple syrup may be among the easiest since maple trees kind of take care of themselves. If you have any on your property, the rest is pretty simple. Collect the sap, boil it, filter it, and pour it on pancakes. There are a bunch of resources about how to make your own maple syrup at home. Some are on the web, published by state agriculture departments, but most are in print. Maple Syrup is an old-timey tradition – the kind that doesn’t jump to the Internet easily. For Internet resources, I found this one from the Massachusetts Maple Producers Association and this one from the Michigan Maple Syrup Association that was around when I originally wrote this in 2011, but the hobby has really taken off so a Google search should yield quite a few new resources. Before you make any other decisions, you’ll need to answer one important question. Do you have access to maple trees, preferably sugar maples? Ideally, you will have figured this out in the spring, summer, or fall when the leaves are visible and identification is easy. But if you’re like most people you’ll wait until late winter and have to figure it out the hard way. There’s nothing that I can really add to the information you can find Googling “how to identify maple trees.” Doing it in winter can be tough, but I do have a trick. Narrow down the area by looking at leaves on the ground … you may have to dig through snow if you live far enough north to have maple trees. Then, on that first really clear day in early spring when you’ve had a cold below freezing night and a nice warm day, go outside. 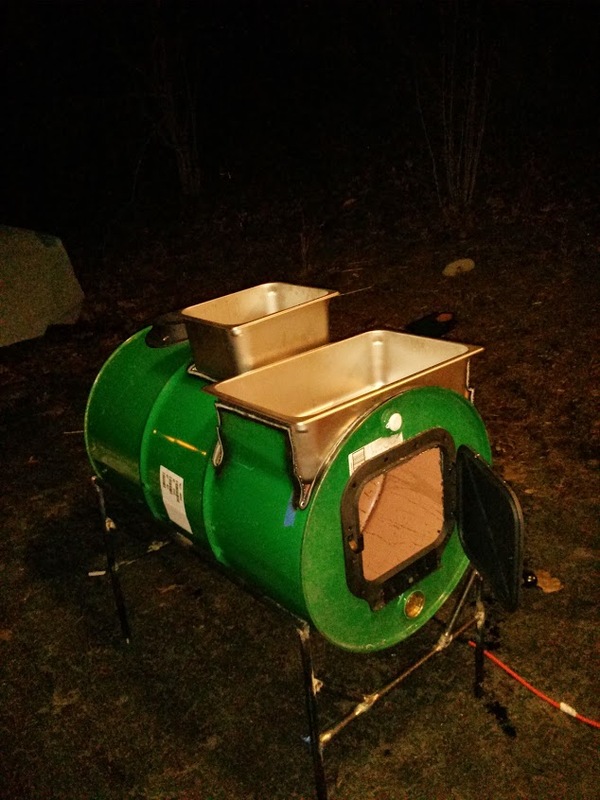 You see maple sap runs best and strongest when a cold night is followed by a warm day (see this from the Massachusetts Maple Producers Association for an explanation). And on the first sap running day in the spring, you can often see trees begin to weep sap. On a warm sunny day you might see a dark stain on a branch. A wet spot. This is the sap running and a definite sign of a maple tree. This is one of the best ways of confirming if a tree is a maple in the dead of winter. Lids to keep out rain, etc. 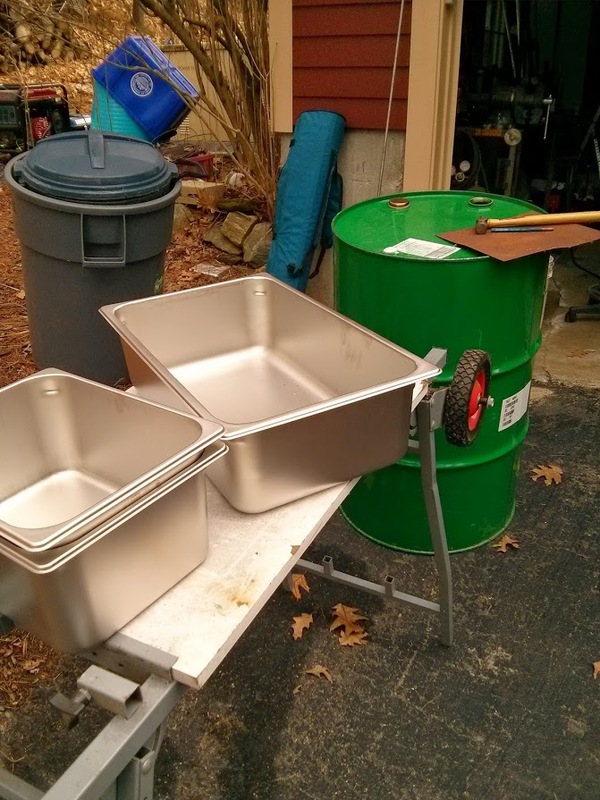 I went for specialized spiles and collection buckets that I bought from the Leader Evaporator Company in Vermont. They make all kinds of kits for the home hobbyist, so I sprung for 3 plastic sap buckets for $5.75 each, 3 plastic spouts for $1.00 each, and 3 lids for $2.50 each. That’s $27.75 for the whole kit, plus shipping. Compare that to some starter kits with the same stuff that cost upwards of $80. 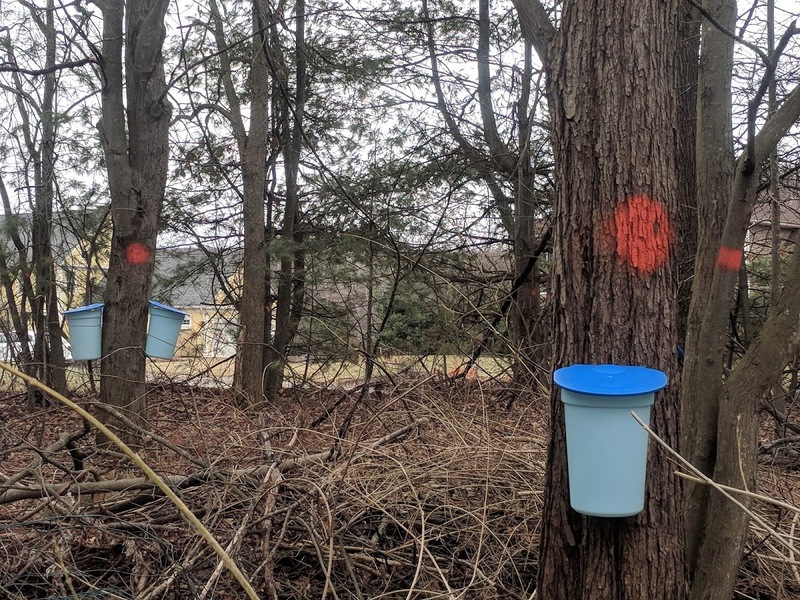 Once you find your trees and have some buckets to collect your sap, just hang ’em up and wait. When you have the right weather, the sap will run. In fact, if you have chosen your trees correctly and the season is right, you will usually see sap running as soon as the tree is tapped. If you want to be careful, you should sterilize your drill bit between drilling holes by dipping it in a mild bleach solution (just a few drops of bleach in a quart or water). Follow the directions that came with your taps for the correct size bit and depth of the hole to drill. When the weather is right, you’ll get a gallon or more of sap from a 10″ diameter tree in a single day. When the weather isn’t right you won’t get a single drop. This is nature, so it’s not predictable. But every day you should go out to your buckets and collect the sap. When our season started in February, we still had 30″ of snow on the ground, so here’s a tip for people living up north, make sure you will be able to get to the trees you select in winter. Sap is like any natural product … it can go bad if not properly handled. So you should collect it regularly and keep it cold. If you collect a lot you might be able to store it outside while it’s cold (many people use a clean plastic garbage pail as a storage tank). I filtered it (to get the bugs out … yes, as the season progresses into March the first bugs start to appear) and stored it in either old milk jugs or old 2-liter soda bottles in my refrigerator. Our season runs from mid-February through March. On a good week, I collected about 4 or 5 gallons of sap from my trees. On a slow week, only 2 or 3. For the slow weeks, I waited 2 weeks in between boiling sessions. I typically waited until I had 4 or 5 gallons of sap ready for boiling. 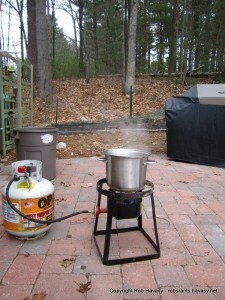 I did my boiling in an old pot over my propane turkey fryer burner and finished on the stove. 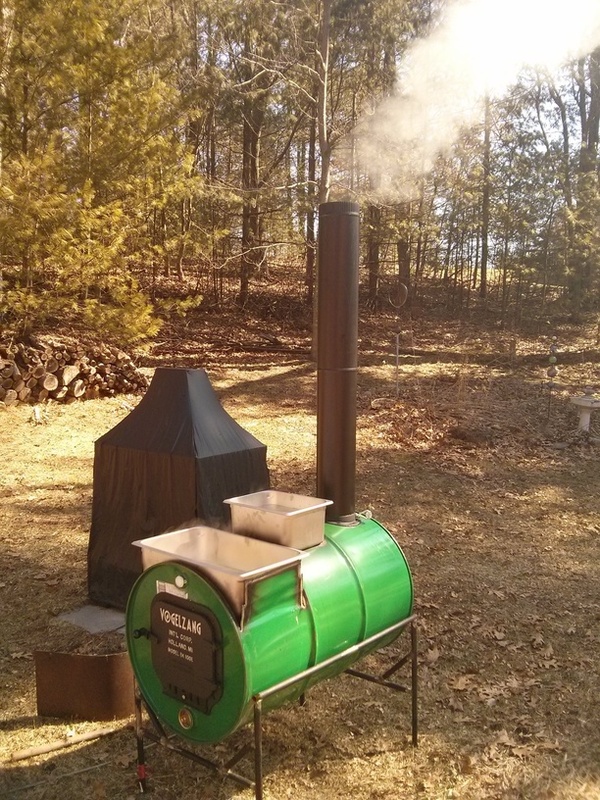 It typically takes 5 to 6 hours to boil down 5 gallons of raw sap. The reason most boiling is done outside is that you are going to drive off a lot of water … more than many home vent systems can handle. So if you try this in your kitchen, prepare for steamy windows and lots of condensation. The secret to boiling sap is to make sure that it doesn’t cook too much and become maple sugar. 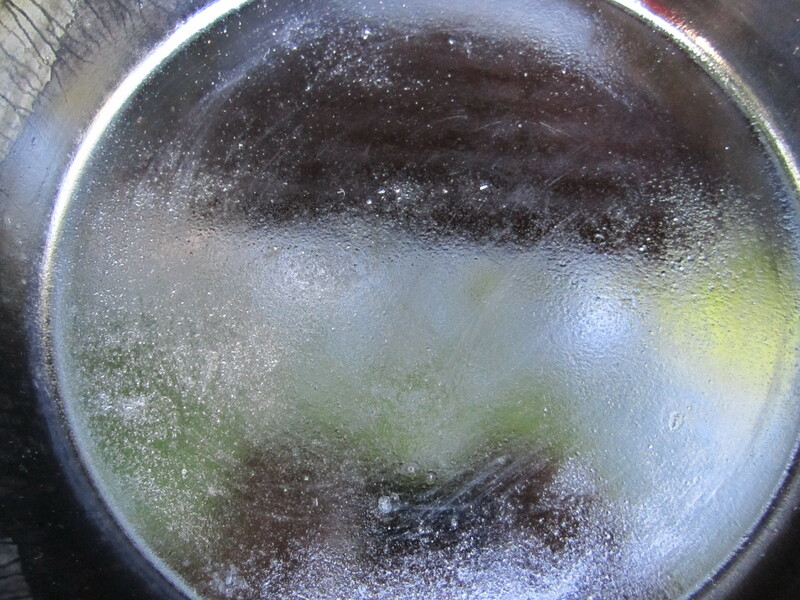 Because the boiling point of a liquid (in this case mostly water) increases with the concentration of stuff dissolved in it, it is possible to determine when the sugar concentration is correct by monitoring the boiling temperature of the liquid. 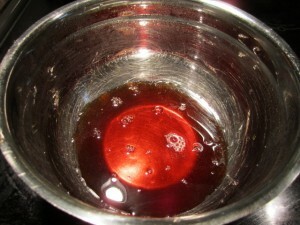 People with experience have calculated that the optimal sugar concentration happens when the finished syrup boils at 7 degrees above the starting point of the sap. But the sap is mostly water and it should boil at 212°F, right? Wrong, that temperature changes with the air pressure which is, in turn, a function of both weather and altitude. 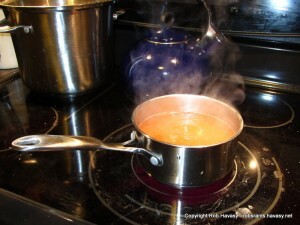 For example, at my house on most days, water boils at 211°F. And so did the sap when I first started boiling it. So my final temperature was 218°F. There’s not really much more to this step. Fill your pot, light the fire, test the temperature when it boils, then keep adding fresh sap until your supply is gone and then keep it boiling until the temperature is 7 degrees F higher than when you started. As I said, I usually finished on the stove where the temperature was easier to monitor. By the way … if you didn’t filter your sap when you collected it, do it now. Bugs make for bad flavor! In addition to water and sugar there are other compounds in maple sap, and as the solution boils down and concentrates, they precipitate out. People call this “niter” or maple sand. And it needs to be filtered before the syrup is packed. There are special filters that make large production easier, but you can also use cheesecloth or other filters if you have really small batches and time. I used a combination of paper towels and cheesecloth. The result is a nice clear syrup … which may vary in color depending on the species of tree tapped and the time of year. I got a nice dark syrup seen here. By the end of my 6 week season, I ended up with about a pint and a half of finished syrup in the refrigerator. If you have much more, you’ll need to think about a safe storage method, like hot canning it in sterile jars.